Carolina Chair in the news! CONOVER Almost a century ago, H.D. Fry Sr. was a farmer, a justice of the peace and a small-time furniture maker who built piano stools and parlor chairs in his barn. When the railroad came through Catawba County, according to family lore, Fry saw his chance to create a furniture company that could ship upholstered chairs and sofas all over the country. Hickory-Fry Furniture, which opened in the 1920s, grew to employ 200 workers, according to Fry's grandchildren, Cathy and H.D. Fry, III. The siblings are still in the furniture business, hanging on in an industry that has seen many factories close. Since 1990, North Carolina has lost more than 60,000 furniture-making jobs, mainly because many companies moved their operations overseas where they face fewer regulations and can pay workers lower wages. Most of the jobs that went away, according to industry experts, were in the making of wooden furniture. Upholstered furniture – plush sofas and covered chairs – has proven more durable, largely because U.S. plants can more quickly fill custom orders for fabric colors and designs. At Carolina Chair, which H.D. Fry, III started in 1999, workers build high-end upholstered furniture. For decades, furniture was part of the heart and soul of western North Carolina. Around Hickory, everybody knew somebody who worked in the furniture business. The numbers have dwindled significantly, but many people in North Carolina still make couches for lounging, ottomans for resting feet and chairs for dining around the table. Last year, nearly 38,000 people worked in the furniture industry in North Carolina, according to data compiled by the Furniture Manufacturing and Management Center at N.C. State University. "The industry is alive and well," said Andy Counts, CEO of the American Home Furnishings Alliance, a trade organization based in Hickory. "I think we're starting to rebound – bottomed out, if you will." There's been a lot to recover from. In 2012, more than 64 percent of household furniture sold in the United States was imported, up from about 41 percent in 2002, according to data from the alliance. With so many jobs already gone, the housing market bust dealt another blow to furniture makers. People didn't need to buy furniture when new homes weren't being sold. Until 1990 or so, the South was the place to make wooden furniture, said Steve Walker, assistant director of the Furniture Manufacturing and Management Center. The area had plenty of lumber and a cheap workforce. But federal and state regulations put strict rules on things such as dust collection and disposal – rules that don't exist in Asia, Walker said. In addition, wooden furniture can be made more easily en masse. An end table can get its start on an assembly line halfway around the world and eventually make its way to a North Carolina living room. Almost all of the furniture-making jobs lost in North Carolina were in wooden furniture, Walker said. "That’s what went away," he said. "The upholstery never really went away." Throughout the United States, domestic furniture makers shipped about $5.3 billion worth of wooden furniture last year, a drop of about 1.3 percent from the year before, according to the American Home Furnishings Alliance. Meanwhile, they shipped nearly $8.1 billion of upholstered furniture, up 3.8 percent from the prior year. H.D. Fry, III and Cathy Fry knew upholstered furniture from the start. Cathy Fry, 56, worked summers in her family's manufacturing plant, which her father and uncles had taken over. "It was great seeing my dad employ people and having jobs for people in the area," she said. When their family sold Hickory-Fry Furniture in the 1980s, the siblings figured they'd get out of the furniture business. But as the Internet gained popularity, H.D. Fry, III decided he could sell furniture online. Now, Carolina Chair makes furniture the same way it was made at Hickory-Fry decades ago. A worker builds the frame for a sofa or chair. Another cuts fabric and sends it over to a seamstress, who puts it on the cushions. Someone else assembles the upholstery to the furniture's frame. But Carolina Chair has only nine employees. And unlike Hickory-Fry, which sold furniture to retailers, Carolina Chair sells directly to customers – and only online. "Consumers are more savvy," Cathy Fry said. "They know how to look on the Internet." While many furniture companies used to make lots of couches that looked the same, companies like Carolina Chair are focusing on high-end custom orders. Although the company sells in North Carolina, many of its products go to customers in New York, California, Florida and beyond, Cathy Fry said. Carolina Chair has a unique marketing strategy – its furniture sometimes appears on "The Price Is Right." Game show contestants guess how much a chaise or a sofa costs, and the company gets some publicity. 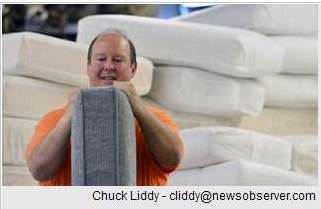 While Carolina Chair has found success in the online world, it might not be the future of the state's furniture industry. Some customers don't want to buy online, Counts said. If a sofa bought from an Internet company is the wrong color, for instance, returning it can be a hassle. But Counts said furniture companies that find a niche will likely find the most success. Those wooden-furniture jobs probably aren't coming back to North Carolina. And as the economy limps toward a recovery, furniture companies are still hesitant to bring on new workers, Counts said. But there have been some promising signs for the industry. In April, Wisconsin-based Ashley Furniture broke ground on a massive expansion of a manufacturing plant in Davie County. Craftmaster Furniture bought an old manufacturing plant in Taylorsville this year, a move that could eventually add 100 jobs. People will always need a place to sit. The future of furniture, Walker said, comes down to building what people will buy. "This is a rule that has been true forever: The product matters," Walker said. Cathy and H.D. Fry, III have built their business on that philosophy. They worry, though, about replacing their plant manager, who will probably retire soon. As the economy has shifted away from the furniture industry, it can be tough to find workers who have the necessary skills, H.D. Fry, III said. But he's optimistic. "The best employee is someone you can train and show them the way you do it," he said. The Fry siblings know how to do it. Furniture is in their blood, after all. Manufacturing furniture is in Cathy and Hubert Fry's blood. The brother-sister team worked in their father's plant growing up, and their grandfather began manufacturing furniture more than 100 years ago. "We have a rich, rich history in manufacturing furniture," Cathy Fry, 54, said. "My grandfather built his furniture using the eight-way, hand-tied seating system and we carried that history on from 100 years ago. It was the best way to build furniture back then and we are still doing it." The Frys have watched over the years as many manufacturers moved their shops out of Hickory, N.C., and the United States entirely in order to lower costs and be more competitive. "It's definitely changed from most of the furniture being made in the Hickory and High Point areas, so many companies have moved out and gone overseas and to Mexico," Hubert Fry, 41, said. "It gets harder and harder to manufacture in the United States. We are one of the few that have hung in there." Their father sold the family company to retire in 1984 and Hubert Fry decided in 1999 that he wanted to get back into the business, but realized he would have to distribute furniture differently in order to compete. "We had spent years and years with the retailer communicating with the consumer." he said. "We never got to talk to the end consumer. Everything we heard was through the retailer. "It had always been done a certain way and with the Internet coming of age, that's the perfect communication tool between a manufacturer and consumer." Hubert Fry started CarolinaChair.com, a direct-to-consumer custom furniture manufacturer. The company takes orders online and by phone. It prides itself on producing first-rate products and providing excellent customer service. "We produce high-quality furniture, unique for you and we get it to you quickly," Fry said. Cathy Fry, who joined her brother's business in 2004 and is now co-owner, said, "Our customers love it when they find us. The big thing is we're made in America and we respond to them 24/7." Hubert Fry says it is unlikely his company would have been able to survive if it had followed a traditional business model. The company's success, he said, stems from being able to educate the consumer about the differences in furniture. "The pressure of all the manufacturers going overseas and not having that quality, you have the consumers go to the store and see a product, but they don't know what's in it," he said. "We can explain that we are creating a high-end product." For CarolinaChair.com, more than a decade of U.S.-made success has resulted from American ingenuity, transforming an antiquated business model into one that is sustainable in today's economy. Despite the economy, North Carolina furniture maker hopeful for the future. CarolinaChair.com is a third generation, family-owned furniture company headquartered near Hickory, North Carolina. The company keeps costs low by not selling in stores and they do not manufacture in bulk for wholesale middlemen. Each piece of furniture is handcrafted one piece at a time, custom built for the customer. How have they survived when so many furniture companies have gone out of business or outsourced all of their manufacturing overseas? "Our customers are looking for furniture with long-term durability and timeless style. They know the difference between real quality and cheap imports," says H.D. Fry, III, owner of CarolinaChair.com. "They really appreciate that our furniture is made in the United States by a family-owned business. When our customers compare our quality and prices to furniture retailers and even online furniture stores, they know that we offer the best value." Fry's sister Cathy Fry adds, "Our customers love that they can customize any aspect of their furniture, including choosing from our thousands of fabrics or providing their own fabric. They can even make style or dimension changes to their furniture without it costing an arm and a leg because we are the manufacturer. And we offer different cushion options. We even send our customers photos of their furniture after it is built. Plus we offer free shipping and in-home delivery for all of our furniture and nearly everything is delivered within six to seven weeks," adds Cathy Fry. Fry's grandfather, H.D. Fry Sr., founded the Hickory-Fry Furniture Company in 1926, trading a portion of his apple orchard for a building he would use to manufacture quality furniture. The company survived the Great Depression and now, more than eighty years later, CarolinaChair.com is growing on the same values of craftsmanship, honesty, integrity, reliability, hard work and pride in building a quality piece of furniture. CarolinaChair.com launched their web site, www.carolinachair.com, in 2000 and appreciated slow but steady growth. They were and continue to be the only North Carolina furniture company that sells its furniture online direct to consumers. 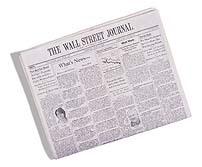 In 2003, CarolinaChair.com received positive national attention when they were featured in a Wall Street Journal article "Can you really buy a couch online?" which chronicled the writer's search for the perfect sofa. In 2009, CarolinaChair.com furniture continues to be featured as prizes on "The Price is Right". "We are proud of our nine year relationship with 'The Price is Right'," says owner Fry. "The show has given our company national exposure that would be difficult for us to purchase through conventional advertising." "Consumers are nervous right now and furniture is a big ticket item, but our customers know that furniture should be an investment not a disposable item. We use all hard wood frames (wood from the Appalachian Mountains) and eight way, hand tied seating systems - the highest quality construction possible. In a way, we are the ultimate green furniture company," comments Dee Fry. "We build furniture built to last at affordable prices and our customers appreciate that." Headquartered near Hickory, North Carolina, CarolinaChair.com is a third generation family owned company that custom builds quality upholstered furniture at affordable prices. The company manufactures a full line of comfortable products for the living room and family room, including the company's renowned sectional sofas, sleeper sofas and love seats and chairs. If you'd like more information about this topic or to schedule an interview with CarolinaChair.com, please call 1-800-653-9757 or email cathyfry@carolinachair.com. Cathy Fry and her brother, known simply as 'H.D. ', are among the lucky ones. The siblings took over the 80-year-old family furniture business, one of many in the Blue Ridge Mountains around here that helped North Carolina earn the title "Furniture Capital of the World." That certainly wasn't the case in the 1990s, when the North Carolina industry fell into tatters, a victim like much of America's manufacturing sector of a high-flying U.S. dollar and a flood of cheaper imports from Asia and even Canada. Once numbering more than 600 individual furniture plants, there are only a handful left, including the Frys' Carolina Chair Inc.
"We're high-end and sell mostly in the U.S., although we have Canadian customers," said Cathy from her factory floor from which the family produces custom couches and ottomans that have been featured on a popular television gameshow The Price is Right. "We've been happy despite the downturn." Even happier days are ahead for the Frys and other U.S. manufacturers, according to economists looking at the bright side of a sinking U.S. dollar. With the greenback losing value against other major currencies -- including the now at-par loonie -- U.S. manufacturers hope they will finally get some currency advantage back in their shipments overseas. "This should be a big plus for North Carolina exports," said Mike Walden, an economics professor at North Carolina State University here. The U.S. furniture industry had already started to see some of the benefits of a weaker dollar against the loonie, says Jerry Epperson, managing partner of investment banker Mann, Armistead and Epperson in Richmond, Va.
Mr. Epperson, whose firm tracks imports and exports of furniture, says upholstered furniture imports from Canada peaked in 2003 at US$196-million, dropping steadily to US$139-million last year as the Canadian dollar increased in value. Meanwhile, wood furniture exports from the U.S. to Canada grew to US$460-million in 2006 from US$315-million in 2001. "And the only export country of significance for us is Canada," Mr. Epperson says. Exporters in states adjacent to the Canadian border, such as Minnesota, are also looking to cash in on the parity party. Minnesota is the largest exporter to Canada, with about one quarter of its manufactured goods heading north. In the first quarter of this year, that was about US$930-million, up 13% from a year ago. Paul Anton, chief economist for Wilder Research in St. Paul, said parity is "good news" for companies that are looking to export to Canada. "Canada is not only the U.S.'s biggest customer but Minnesota's," he said. "So this represents a real opportunity for Minnesota companies." There is another benefit for Minnesota and other states close to the border. "I think you'll see more Canadians coming down here to shop instead of Americans going north," Mr. Anton said. Members of the Carolina Chair team who built the furniture for Sipe's Orchard Home at their plant in Conover. From left to right are, sitting, Johnny Pope, Chris Armstrong, Frances Moose, and Loretta Wagner; standing are Charles Sigmon, Lynn Bustle, Jimmy Church, and H.D. Fry. Cathy Fry was unavailable for the photo. Carolina Chair in Conover created a number of sofas and chairs for Sipe's Orchard Home. "This is a great donation for us," said Chad Scott, the Home's Chief Operations Officer. "The kids and the staff are really pleased. Our furniture gets a lot of use with group meetings, studying, reading, TV watching, and other free time activities. These pieces look great, and they're incredibly comfortable." From their plant in Conover, Carolina Chair hand crafts a wide array of custom furniture and sells directly to the public via their web site, www.carolinachair.com. Carolina Chair's founder and president, H. D. Fry, III, said his employees were more than happy to pitch in and work for a good cause. Sipe's Orchard Home is a United Way agency which depends upon donations from the community to support its work with children. Sipe's Orchard Home serves adolescents, preschoolers, and families with residential and day programs. Located in rural Catawba County, Sipe's has been helping children since 1945. Many of the children who live at Sipe's are victims of abuse or neglect; most have emotional or behavioral troubles which make it impossible for them to function in their own homes, schools, or communities. Sipe's caring and attentive staff members create a safe, consistent, and therapeutic home for these children where they can come to grips with the traumas of their lives, practice new coping skills, and move forward successfully. The non-residential programs at Sipe's focus on at-risk preschoolers. With day-treatment and More-at-Four classrooms, the Home helps these young children address a range of behavioral, emotional, and academic needs. All of the children at Sipe's enjoy the spacious campus, with horses, fishing ponds, woods, basketball courts, and ball fields. Experiencing a variety of activities helps the children discover new skills, interests, and self-confidence. That growth fosters healing; most of the children leave Sipe's after about a year. Sipe's is a United Way agency, accredited nationally by the Council on Accreditation, licensed by the North Carolina Division of Facility Services, and endorsed by Catawba County's Department of Mental Health. Can you really buy a couch online? Skeptics say you need to feel it, see it, sit on it. We wanted to prove them wrong. When I got married two years ago, the best man stood up at the wedding to offer his condolences to me—not about the man I was marrying but the couch I was inheriting. "You will know if you have ever sat on the blue couch," he told the crowd at the reception, "because you will immediately feel scratchy and itchy all over." He wasn't the only one that loathed my husband's 11-foot-long curved blue sectional. I couldn't stand the little clouds of dust that rose from it each time I sat down. Other friends complained that the sofa's back was so low that their heads hit the wall behind the couch. And it was impossible to sit on it during the summer without breaking into a rash. My husband bought the couch used for $200 in 1984 when he was a post-doctoral graduate student, and he claimed it had served him well for many years. He had moved it into three different apartments and had used it as a bed for visitors. But our wedding was the couch's death knell: About a dozen of our friends have us $1,400 toward buying a replacement. At that time, we had no idea it would lead to the Internet, and to our riskiest online purchase ever, in which we would spend nearly $3,000 for a couch we had never seen—or sat on. We're confirmed Internet addicts, who go online to buy books, shampoo, shoes, clothing and all our airline tickets. We have even bought furniture, a platform bed frame, online. But a couch? A couch is often cited as precisely the kind of product people will never buy online. It's something you want to touch and feel and sit on. My husband wanted to know if the couch would be deep enough for his long legs, while I was concerned that it be wide enough for comfortable napping. And then there's the question of selecting a fabric and color—which can appear distorted online. That kind of thinking was one reason for the skepticism that greeted the first generation of online furniture stores, such as furniture.com and living.com, both of which failed spectacularly. Jupiter Research, a New York-based market-research firm, estimates that $252 million of furniture was sold online in 2002, up 95% from $129 million in 2001. The e-commerce category has continued to grow rapidly every year, despite the poor economy, as more and more Americans go online and get comfortable shopping there. Still, that's a tiny fraction of total retail furniture sales, which were about $52 billion last year, according to UBS Warburg analyst Margaret Whelan in New York. Us: "We like this, but we wonder if you have a different color than this lime-green/beige combo?" Salesperson: "Hold on, let me get the sheets on this." We then wait 10 minutes while he or she finds a looseleaf binder and pages through to find the model we're sitting on. Salesperson: "It looks like there is only one other color available, a yellow/orange combo, and that will take 12 weeks to make." Us: "Is the price the same?" Salesperson: "Not really, the yellow/orange combo is more expensive fabric, so I'll have to recalculate how much each piece costs." Another 10 minutes pass while the salesperson calculates the new price of each piece of the sectional, then scrawls a price on the back of a business card. Us: "What if we wanted to configure it with the long piece on the right instead of on the left as shown?" More complex calculations are made, and the salesperson scrawls another price on the back of the card. For us, accustomed to the ease of getting information online, this was a tedious and frustrating process. In the stores, it was nearly impossible to figure out the components of the price quotes—how much of the price variation was due to the fabric, how much did each piece of the sectional cost on its own and what would be the cheapest combination of these factors? And, surprisingly, seeing and feeling the couch didn't help all that much in judging its quality. But going to showrooms did have two benefits: We figured what dimensions we wanted in a couch and what type of fabrics we liked. We had read—on the Net, in fact—that the best kind of couch construction was "eight-way hand-tied," which means that the springs are manually tied to each other to form a flexible, floating suspension. Many of the salespeople we ran into didn't know if the couches they were selling had the eight-way construction or the cheaper sinuous springs. The same thing happened when we asked whether the frame was kiln-dried hardwood with reinforced corners, another feature of well-made sofas, according to our research. So, inevitably, we turned to the Internet. We used Google to find an eight-way, hand-tied sectional—and a vendor, CarolinaChair.com. It advertised its quality construction, free shipping and 30-day-money-back guarantee: They will pay the cost of shipping for a return, excluding items made with custom fabrics, within the first 30 days. And the prices for sectional sofas were about $1,000 to $2,000 cheaper than those in the stores. Unlike other Web sites that sold sofas, CarolinaChair.com actually does its own manufacturing in Conover, N.C. Later, when I called the company, the founder, H.D. Fry III, who goes by Dee, said he is the only furniture factory in North Carolina that sells directly to consumers. Most of the nation's furniture makers, 80% of which are all located in a 100-square-mile area in North Carolina, sell to retailers rather than direct. Mr. Fry, 33 years old, thought up the idea for the business when he was working at his first job after graduating from the University of North Carolina at Charlotte. Mr. Fry was working at a furniture manufacturer, just like his father and grandfather had done, when he started thinking about applying Dell Computer Corp.'s extremely profitable business model of selling computers directly to consumers through the Internet. "I thought, 'Hey, they're doing it in computers, why can't we do it in furniture?" Mr. Fry recalls. Using his own money, Mr. Fry launched CarolinaChair.com in March 2000 with four employees. The company has since grown to a staff of seven. And through word of mouth and Internet marketing, its output has grown to about 30 couches a week, Mr. Fry says. Everybody on staff helps make the couches—even Mr. Fry, who says he cuts fabric. Chad Moretz, the marketing manager who responded to all of our e-mails, also stuffs cushions, Mr. Fry says. To keep costs down, CarolinaChair.com only makes about a dozen styles of couches and stocks about two dozen fabrics. Mr. Fry says the typical couch takes three days to complete, if there are no hiccups, and four weeks maximum. The company guarantees it will deliver a couch within six weeks of receiving an order—including two weeks for shipping and delivery. The speediness was a key selling point. My parents were planning to visit in 10 weeks, and we needed a place for them to sit. At the Ethan Allen furniture store, we saw a couch we liked but the saleswoman said it would take 16 to 20 weeks to make it in the fabric we liked. We saw a couch we liked at retailer Pottery Barn. But when we measured it, we realized it wouldn't fit into the door to our apartment. In the meantime, we ordered fabric swatches from CarolinaChair.com. They arrived in an overnight envelope, but they were tiny, palm sized strips of fabric, and the only one that was 100% cotton was in a color and weight that we didn't like. So we decided to check out the 7,500 custom fabrics advertised on CarolinaChair's Web site. Unfortunately, they were only searchable by color, so we ended up paging through 1,200 green fabrics trying to find ones that were the 100% cotton brushed twill that we had fallen in love with at one of the furniture showrooms. We soon gave up on that approach. Searching the Net, we found the site of Diversitex Inc., a West Caldwell, N.J., fabric supplier, that seemed to specialize in twill. A package from Diversitex arrived in the mail with dozens of fabric swatches in every kind of twill imaginable. The swatches were huge—each the size of our freezor door—and the sage green was exactly what we wanted. Until now, all of our contact with Chad had been on e-mail. But for the final purchase, we wanted to talk to him. My husband had a bit of trouble reaching him until he realized that Chad's work hours (weekdays) were different than our couch-purchasing hours (evenings and weekends). When they finally spoke, my husband gave him our credit-card number. Chad said the credit card wouldn't be charged until the couch was shipped. On Nov. 12, Chad sent us an e-mail saying the fabric had been received and that we should receive the couch by Dec. 21. On Nov. 25, we noticed that the credit card had been charged, meaning the furniture had been shipped. On Dec. 5, a local delivery company called to set up a delivery time. The delivery guys said they would come between 9 and noon on Dec. 1—they showed up promptly at 9:30 a.m. And the sofa was beautiful. There was only one problem. The smallest piece of the couch—the corner piece—wouldn't fit in the door of our apartment. The movers turned it every which way for two hours, and my husband, an engineer, did calculations. There was no way to get it in. We had measured the two large pieces to make sure they would get in, but wrongly assumed the smallest piece would fit. Chad was sympathetic, but said the return policy didn't apply to custom pieces. The corner piece sat in the hallway for two days. Finally, we mustered the energy to turn on our computers and search for a solution. Soon enough, we found TakeApartSofa.com "Door too small? Hallway too narrow? Can't turn that corner? The Sofa is too big? WE CAN HELP!" the site crowed. The Internet has proven it can handle all the traffic the world's masses can send it. The billions of us who just want to surf, download music, trade political tirades or buy products have found a permanent home. Yet how much room is really left for e-commerce entrepreneurs? Can successful Internet startups still be launched on a shoestring? Some analysts say the same companies that dominated most of the 20th century will control the online economy in the next. Businesses are still entering the market on both ends of the scale. The Piedmont is home to online newcomers who succeeded well before the birth of the Internet, as well as those hoping for their first fortunes. Carolinachair.com of Hickory hasn't been on the Net much longer than Triplin's venture. The Web site operates without the benefit of a single brick store, and its wares can be seen from coast to coast on "The Price is Right." The company has operated for about 18 months. But the company's rapid rise may be misleading. Its overnight success began more than 80 years ago. The founders of Carolinachair.com have generations of experience in the furniture business. President H.D.Fry III, 32, connects the family's business savvy to that of his grandfather, who started Hickory Fry Furniture in the early 1900s, financing the business with the sale of an apple orchard near the railroad tracks. These days, it's hard to imagine a time when furniture manufacturing was considered an experimental leap. But the elder Fry started well before the assembly line became commonplace. "He was skilled as a craftsman," Fry said. "At that time there were no manufacturers of furniture, there were just people doing it in their houses and in their barns." Fry understands his grandfather's experience even better now that he has taken an equally formidable risk. "I wouldn't be telling the truth if I said I didn't feel any queasiness," Fry said. "I did feel it was time to go onto the Internet. The very first task was to make a top quality product." Carolinachair.com recently found a high visibility forum for its products when it entered into an agreement with the TV show "The Price is Right." The show gives its furniture away as prizes. "I called them up and pitched our furniture to them, and they bought it," said marketing director Chad Moretz, Fry's 27-year old nephew. With Moretz's answer to a prize-winning marketing question, the company gets it products before 7 million people a day. The show's spokespeople were anything but encouraging at first. "Basically, they said, 'Let's just go ahead and tell you that there's a 99 percent chance that we don't want to have anything to do with you,'" Fry said. But the immediacy of the Internet bettered the odds. "It wasn't but an hour or two later that they called back," Fry said. "They loved the product. Everything was right in front of them. They said it was so easy to go through the site." From there, the prize managers quickly arranged for the site's furniture to become part of the winner's loot. Moretz likens the operation to Dell Computer, which also doesn't operate a single brick store. "We are the first furniture manufacturer, period, to sell its products totally over the Internet." How is this company different from the other furniture corporations that have found the Internet to be a black hole for profits? For one thing, it's the position of the retailers. There aren't any. "We are a manufacturer and took a totally different route," Moretz said. "We survived, and they failed." Eliminating the middleman also lowers prices. "We're actually a high-end product but we sell it for a middle-range price," Moretz said. Since the recent collapse of some furniture sites, analysts have sifted through the ashes to find out why. Some have reasoned that the nature o the Web page itself led to the downfalls. Take the user's browser screen. Browsers are notorious for displaying the same image in slightly different ways. But slight differences in color can make or break a sale for a customer's living room set. Carolinachair.com uses some traditional means to offset the Web's disadvantages. It encourages its buyers to order fabric swatches, so they can see and feel the fabric before purchasing. For those customers worried about returning goods, it offers a 30-day money back guarantee with shipping charges paid for returns. Customers receive orders within six weeks of making them. Prices also include free delivery. "We have a great time," Moretz said. "We actually talk to the end customer every day. You learn trends a lot quicker. Consumer trends are up to the minute." "People try to lump furniture online into one group," Fry said. But he argues that the wreckage on the Internet roadside is that of retailers, who were a poor fit to begin with. "They didn't control anything, they were just kind of like a middleman. People loved the price, but they certainly didn't love, after six months, not having their furniture." The go-go 1990s didn't impress Fry as much as they did some aspiring business people. "Most of the startups were venture capital whims," Fry said. "If you're really on the furniture side of it, you need to know exactly what's going on. It's not for everybody, that's for sure. "I think nowadays you have to have experience in what you're going to do before you trek out on the Internet. It's not like five years ago, when venture capitalists were begging you to do something." Durability, style and comfort are the attributes consumers look for when choosing furniture. That's why furniture manufacturers choose DuPont™ DuraLife™ fiberfill for their upholstered pieces. Manufacturers rely on DuPont's commitment to continuous research and technical innovation which results in fibers with higher loft and better performance. "When you sit on an upholstered piece, comfort is crucial," says Steve Folkman, director of sales and marketing, Stanton International of Tualatin, Oregon. "Consumers certainly want their furniture to look nice and last long, but the very next thing important to them is comfort. And that's where DuraLife™ provides such a benefit." Engineered for maximum loft, comfort and support, DuraLife™ fiberfill technology utilizes engineered, high-void-content, helical fibers. These fibers deliver superior bulk support and loft versus generic fiberfill. This provides a wider range of "soft to firm feel" for the user without sacrificing product appearance. DuraLife™ was specifically engineered for seating and bedding applications, and is used by many new, innovative furniture manufacturers. H.D. Fry III, president and owner of Carolina Chair, located in Hickory, North Carolina, describes DuraLife™ as having memory. "It really holds its consistency and spring and doesn't give like other fibers. When you sit down and get back up, it resumes its shape. That's a very significant factor for us, because consumers want a quality product that will remain new-looking for years to come." DuPont conducted a series of tests that replicate five years of residential use. Results indicated that back cushions filled with DuPont DuraLife™ retain 15 percent more loft and 17 percent more bulk support than generic fiberfill. All DuraLife™ fiberfill products resist matting, clumping and mildew and, unlike natural fibers, are hypoallergenic and nonabsorbent. "Another key factor we've found with DuraLife™ is we're getting a better yield and using less," says Stanton International's Folkman. "You definitely get what you pay for. When considering DuraLife™ versus generic fiberfill, the increased loft will offset any price difference between the two." Research, development and technical expertise are other areas where manufacturers feel DuPont DuraLife™ outperforms generic fiberfills. "DuPont products are put through years of testing before they're brought to market," says Gurney Davis, president and owner of Prestige Pillow, located in Conover, North Carolina. "You know what you're getting when you use a DuPont product. For manufacturers like myself, knowing technical support is available to answer any questions is a big selling point for me." Fry of Carolina Chair also appreciates the value associated with the DuPont name. "Aside from the DuraLife™ fiber being different than any other fiberfill we've found, we like that the name is backed by DuPont. Consumers associate the name DuPont with science and research and that association helps us sell our product." According to Tom Kearns, director, DuPont Global Home Textiles, DuPont is always exploring new fiber technologies. "We are constantly working with furniture manufacturers and consumers to develop innovative solutions and products to meet their needs. We work hard at developing one-on-one relationships with manufacturers and getting feedback from consumers, which gives us a real advantage in our R&D work. The DuPont DuraLife™ brand name, now part of the Home and Industrial Textiles group, will continue to be associated with durability, style and comfort and with driving improvements in furniture and bedding textile manufacturing processes." DuPont Apparel and Textile Sciences is a global branded business linked to DuPont science that brings innovation to all categories of apparel, accessories, home and industrial textiles through brands like Lycra® elastane, Tactel® textile nylon, CoolMax® performance fabrics, Thermolite® performance insulation, Cordura® nylon and Comforel® sleep products. Since inventing nylon in 1938, DuPont has been at the forefront of introducing fiber technology that meets consumer expectations for new and better products as well as improved lifestyles. DuPont is a science company, delivering science-based solutions that make a difference in people's lives in food and nutrition; health care; apparel; home and construction; electronics; and transportation. Founded in 1802, the company operates in 70 countries and has 93,000 employees. CONOVER, N.C. (AP) -- Third-generation furniture maker H.D. Fry III has witnessed the premature deaths of many furniture dot-com retailers. Still, he's confident his company, CarolinaChair.com, has what it takes to succeed where others have failed. That's because CarolinaChair.com is different from those companies, which were essentially middlemen selling someone else's product. CarolinaChair.com only sells the product it makes, upholstered furniture. "Consumers weren't getting anything new, different or better from these furniture retail sites than they were from traditional furniture stores," said Fry, 31. "With us, you're actually going to the factory and buying it." While Fry planned his Web-based venture, several online furniture sites -- including furniture.com and living.com -- had already started up and were planning to make initial public offerings, or IPOs. By the time CarolinaChair.com finally came on line last year, several of those furniture e-tailers were already filing for bankruptcy protection. "In reality, we're a hybrid. We're a furniture manufacturer married to a dot-com," said Fry, who compares his company's marketing strategy to the online sales success of computer manufacturer Dell Computer Corp. Unlike PCs, furniture has not proven a big seller on the Web. It now stands at about $100 million annually while the total U.S. furniture retail market exceeds $60 billion. Online furniture retailers who can deliver solid customer service along with slick Web pages and computer graphics will be the ones who survive, industry analysts have said. Meanwhile, industry officials have projected the amount of furniture sold over the Internet will grow to about $1.5 billion a year by 2003. CarolinaChair.com has been in business for just over a year. While Fry won't disclose financial information, he said sales have increased every month since the company opened. The company shipped furniture to customers in every region of the country last year, he said. Behind the firm's web site is a traditional North Carolina furniture company, not unlike the Hickory-Fry Furniture Co. started by Fry's grandfather, H.D. Fry, in 1926. Six employees make all the sofas, chairs and other pieces using time-tested construction methods and premium components. And unlike most large furniture manufacturers, CarolinaChair.com can deliver a custom-ordered sofa, loveseat or other upholstered piece of furniture in about six weeks. The usual wait is 12 weeks or more. "Our whole theme is manufacturing furniture," said Chad Moretz, 27, the company's marketing director. "Instead of spending a lot of money on marketing and fluff to get attention, we've been spending it on our product." With no middle man, CarolinaChair.com is able to sell high-quality furniture at very competitive prices, Moretz said. "Our biggest challenge is getting people to buy furniture without actually sitting in it," Fry said as he led a visitor on a tour of the company's small plant, which was constructed with expansion in mind. To entice Web shoppers to take a chance, CarolinaChair.com offers services such as free shipping and a 30-day money back guarantee. "I had one guy call me at home on a Sunday night to tell me we couldn't sell top-quality furniture for the prices we advertise on the net," he said. "I told him we can if you just think about it." Fry said he decided to focus on upholstered furniture because he was groomed to make that kind of furniture. Only the technology used to sell the sofas, chairs and other furniture pieces has changed, he said. "The others that have failed at selling furniture online didn't know the furniture business," he said. "We do, and we're enjoying our time doing this." CONOVER - As the dot com graveyard grows seemingly on a daily basis, a local company hopes its uniqueness will allow it to survive and flourish where others have failed. H.D. Fry III, president of Carolina Chair Inc., believes his manufacturing company can avoid the problems that have afflicted many online companies, including several furniture Web sites. The online company casualty list numbered 210 in 2000, according to a recent report released by Webmergers.com, a San Francisco research firm. Of those, 60 percent fell in the fourth quarter. An estimated 15,000 dot-commers have lost their jobs because of the industry implosion. Fry's company differs from other furniture sites by custom manufacturing the upholstered furniture it sells online, thus allowing the company to market directly to the consumer. “We have watched some of the other companies try the same old retail concept on the Internet and fail," said Fry, who followed his father and grandfather into furniture manufacturing. “The companies that are thriving on the Web are the ones that have offered new options for consumers. The ones that failed didn't offer anything new to the online customer. What we are doing has never been done." He believes there is a better way than the furniture industry's established system of manufacturers supplying products for retail showrooms. “With the traditional system, you never get to really know exactly what the customer thinks about your furniture," Fry said. “It seemed like a logical step to go to the Internet, because you're able to talk to the end consumer and take all their suggestions. When you hear the word 'Internet,' it should be simpler and easier to use." The company launched its Web site and started manufacturing in September after seven months of planning. When the planning process started, several online furniture sites had begun operations and were planning initial public offerings. By the time Fry's Web site went live, several of the online retailers had already failed. “The retailers have gone on the Internet, but haven't changed anything," said Chad Moretz, the company's marketing director. “There's no difference in going on the Internet than going to a store. You need to give them an advantage or incentive to go to your Web site." Fry and Moretz acknowledge the environment for online buying isn't currently at its best. Many potential customers have been eliminated through poor experiences with other online companies. “We want customers to trust a manufacturing company and to build a relationship with us," Fry said. “We hope to reach them by opening our factory doors and making furniture for the consumer, not for a retail outlet." The six-employee online start-up hopes to beat the odds and succeed. “It's a big step to start something from scratch," Fry said. “You can talk about it, but until you get in there and do it, there's nothing like it." “Whenever you start something new that no one else has done, you make the rules," Moretz added. “That's what's so much fun. We don't have to use anyone else's guidelines, we're making our own." Fry and Moretz compare their direct-to-consumer concept to that of Dell Computer. “People have been selling through catalogs for a long time," Moretz said. “What we're doing is just like mail order, except our catalog is our Web site."